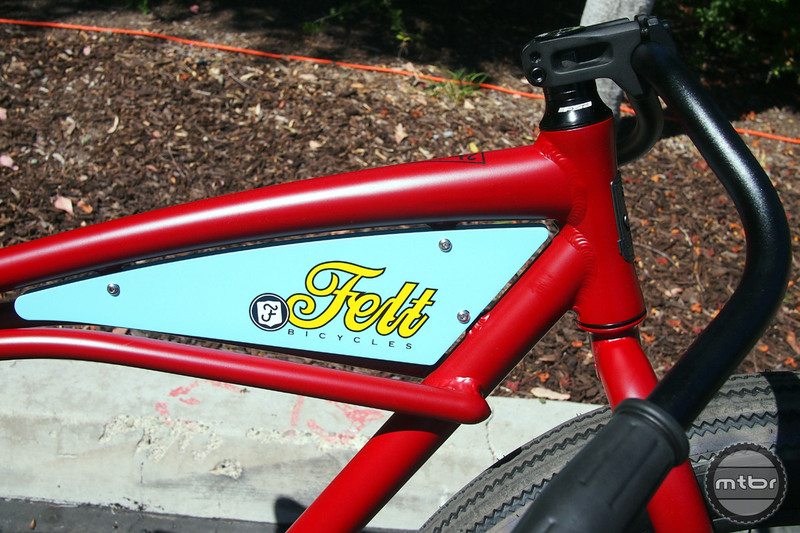 We took a visit down to Felt Bicycles in Southern California recently and saw some new highlights to their cruiser bikes. With the growing popularity of fat bikes, it’s not surprising that a manufacturer like Felt would take advantage of this for a refresh of their popular Speedway, Float and El Nino cruisers. Key to all of these cruisers is the Felt Zig Zag fat tire made by Vee Tire Co. Inspired by motorcycles, the Speedway has an aluminum frame and fat bike size tires and retails for $899 (click to enlarge). The Felt Speedway was inspired by speedway racing motorcycles, a racing discipline that sees the rider throw the bike sideways into every corner while railing around a dirt oval. This Speedway is a 2-speed cruiser with a low slung frame and low bars (actually the standard bars just flipped upside down) that give it a “committed” look. The aluminum frame plate is a nice touch and lends itself to customizing (click to enlarge). The frame is aluminum as is the name plate. The cromoly fork has straight blades and a unicrown. Nice touches include a springer saddle with riveted leather-like cover and pedals are included. The drivetrain is a Sturmy Archer 2 speed with a 36T chainring, KMC chain and coaster brake. 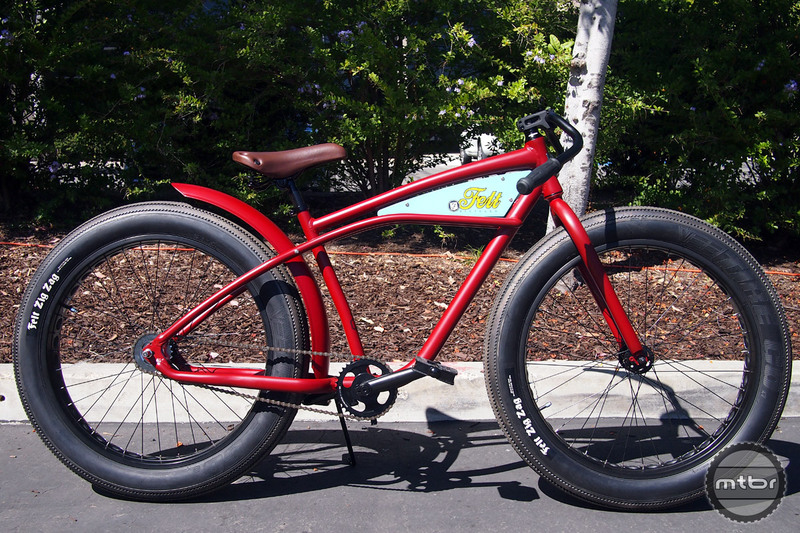 The Brick Red Speedway 2-speed from Felt has an MRSP of $899 and is available from your local Felt dealer today. The Felt El Niño features a rear disc brake and a simplified single speed drivetrain (click to enlarge). 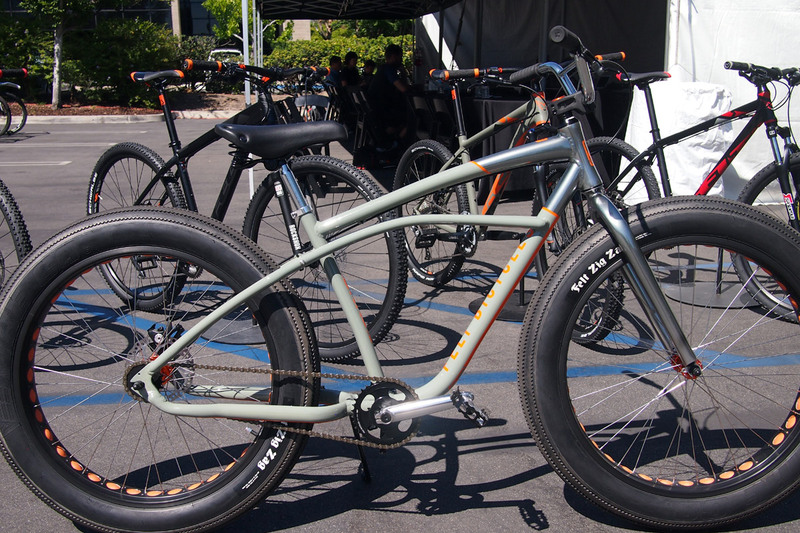 The El Niño is constructed with the same aluminum frame as the Speedway but this bike features a rear disc brake and a simplified single speed drivetrain. The colored aluminum hubs and matching tubes give this bike a nice subtle touch of bling. This bike also features a more moto-cruiser styled handlebar instead of the higher rise bars on the other models shown here. The Satin Army Green/Tungsten finished El Niño 1-speed from Felt has an MRSP of $899. 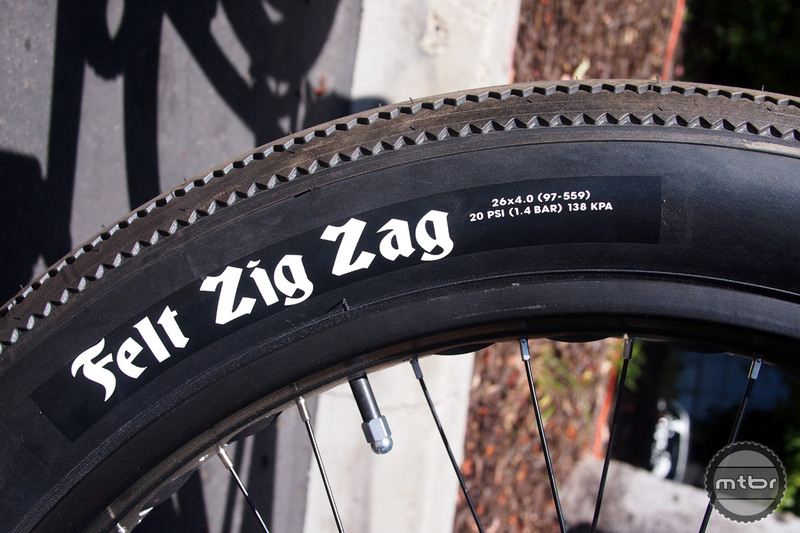 Made by Vee Tire Co. for Felt, the Zig Zags are 26×4.0 in size (click to enlarge). I wonder if a 29+ wheelset will fit in these? Is there an Enduro version of this?